I strive everyday to make my design work apart of the world but really I’m begging for the world to be what my work is about. There is nothing more gratifying in my life then to design for the benefit of others, communities, the environment and more. There are so many areas that lack in good design that I continuallythink about redesigning. Areas needing redesign to help reduce stress, complication, insult and to create ease, make people feel like they’re valued, intelligent, apart of something and paid attention too. For example, I’d like the Department of Motor Vehicles (DMV), NYC MTA Subway Transit (navigational signage sector) and the U.S. Postal Service to hire designers; there is no need for those simple tasks to be so confusing and take so long. I also want the U.S.A to redesign the voting of America and rethink at the design rules for the U.S. in general. That aside, my thesis work was about how design can be intergrated in the cure and prevention of America’s obesity. I branded the mission, I brought organizations together to help move things forward quicker as well as bringing benefits to more people. I looked at the issues on all angles and found solutions for everything under the sun. For example, some of my solutions were working with local farmers to provide fresh fruits and vegetables to communities that were lacking. I merged fresh markets to organizations to food packaging and to delivery. I also designed tools to educate. I created an easy to read seasonal food calendar printed on shopping bags and kitchen towels so that the information is accessible where most food choices are made. 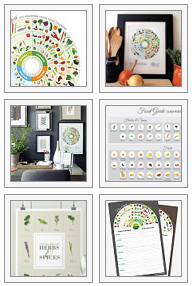 In October, my sister sent me a link for GOOD Magazine’s contest to redesign the Food Pyramid. This assignment consumed me. I already had the knowledge and tools to compose my solution and I started immediately. I submitted my entry by the first deadline (I only had 6 days to complete it). I later found out the deadline was extended so I submitted another revised version after a month’s extension. I learned recently that I was picked as a finalist for the contest which is fantastic news. Although, GOOD posted my first submission entry (top image) and I prefer my second (left). My final solution addresses the complications of the first entry such as typos, key to help read the guide and also I introduced alternative food ideas such as herbs and spices. On December 20th, GOOD Magazine and brilliant Marion Nestle, author of Food Politics, will announce the winner. The winning food guide will be published in their December issue as well as on their website. In all honestly, I hope to win and my fingers are crossed for my dream to have opportunities more like this – to do work for the benefit of people and communities. 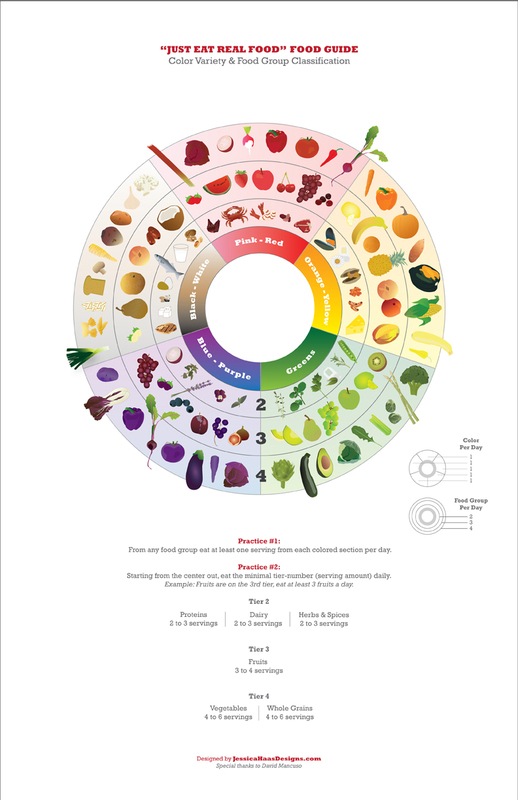 This entry was posted in Educate, Graphic Design, Jessica Haas Designs' Work and tagged contest, design, finalist, food pyramid, GOOD, Good magazine, GOOD Magazine's contest to redesign the Food Pyramid, graphic design, graphic designer, redesign. Bookmark the permalink.